First a voice prompt will tell you which degree to sing. Try singing it before the degree is played by the 12 string guitar. Then quickly try to sing the root of the key before it plays. This may take a few listens, but you can see how this can really make ear training fun because you are hearing your favorite music at the same time! Listen to this track over and over. Hopefully you will find that you can sing the designated degree and well as the key center. Then try picking out some notes of the melody. I’ll bet you are starting to recognize some of the pitches. Ear Training just got to be LOADS OF FUN and FINALLY some instant gratification and instant application! This also points out how the Bundle is the way to go. If you are listening to a jazzy sort of track use the Tenor Sax sound. If you are listening to classical music use the piano. If you are listening to a folk or rock music use the 12 string sound. 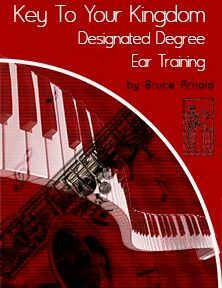 The Key to Your Kingdom-Designated Degree Ear Training course as you can see from the popular music example above can be used instantly with your favorite music. This means you can apply your ear training skills to any music. But that is only one of many benefits of this new course. Key to Your Kingdom is also a major step ahead for contextual ear training because it gives you two new exercises to help students that have weak key retention and problems modulating. These are two problems that hold back many students and these designated degree exercises can help you fix these problems. Two Major Problems That Students Often Experience. Key to Your Kingdom exercises target two problems students often have when attempting to master “One Note Ear Training” or “Two Note Ear Training.” Key to Your Kingdom ear training also tackles how to control modulation to new key centers. While this helps with Two Note Ear Training it actually helps develop the ability to hear superimposed key centers. In other words you can create your own key center(s) over the underlying key center of a band or jam track. Advanced improvisers often use this technique of creating melody which is in another “Key(s)” than the underlying music. All of this is all done with a simple exercise that comes as an MP3. The Key to Your Kingdom course can be purchased with a piano, 12 string guitar or Tenor Saxophone. There is also a Bundle available that includes all 3 instruments. Each instrument has it’s pluses and minuses so I often recommend getting the Bundle. For instance, a piano has a much larger range but has a tempered tuning so the lower notes will be sharp and the higher notes will be flat. The 12 String Guitar fairly large range but some beginning students have troubles with a stringed instrument because of it’s rich harmonic structure. The Tenor Sax has none of the problems listed above but does have a limited range. Each student may or may not be affected by these pluses or minuses so I recommend the Bundle so that you can work around any issue and give you a more realistic musical situation where multiple instruments are playing. There are two types of exercises in the Key to Your Kingdom course. “Static” which works of developing a better sense of key. “Modulating” which helps an Intermediate to advanced student modulate to new key centers. Let’s take a look at how each works and who will benefit from these exercises. The “static” exercises help a beginner ear training student to develop a better sense of key center. Sense of a key center is often the reason a student can’t do the “One Note Ear Training.” They lose their sense of the key immediately after the cadence creating the key center is played. This of course means they won’t get the note correct. They have lost the “key center” which is the foundation for which the whole “Contextual Ear Training” concept is built. Test yourself with the examples below and if you can’t do the exercise or you are not getting 100% correct answers then this is the course for you. The samples are all in the key of “C.” You will first hear a voice designating a degree. Second you will hear that degree play by an instrument and final you need to sign the root of the key before the key center is played. There are 3 levels to these “Static” exercises. Each level waits longer before playing the tonic. These files are available in all keys. Again all the examples below are in the key of “C.” Of course you can make your own play lists to make these exercises much easier or harder. If you are having difficulty try listing a few times to these examples usually your sense of key will start to kick in and you will be able to sing the root much easier. Remember no cheating: Don’t sing up or down to the tonic. Don’t resolve a note to another note to find your key center. You should just sense the key. If you don’t then this is an excellent place to start. Remember from hearing the note on an instrument you need to infer the key center. By using the bundle you could create a play list with different instruments. Test yourself below and see how you do with these level two files using all three instruments. Remember you are in control of how hard these exercises are. You could just play a few notes in one octave or all notes. It’s up to you to decide. “Modulating” which helps an Intermediate to Advance student to modulate to and from any key or key center(s). The MP3s are built in a way that allows multiple key modulations with the “Modulating” MP3s. These MP3s also allow a student to built any type of key center moving to any other type of key center. For instance, let’s say you wanted to work on modulating from a Symmetrical Diminished key center to a Major 7#5 key center. All you need to do is pick the keys you want. Let’s say A Symmetrical Diminished and G Lydian #5. Then make a play list that contains the notes of these two scales. But this in a mobile phone or computer, place the device on shuffle play and you are working on this modulation. I often tell students to do this with their original music so that they improvise better because they hear the modulations better. The Modulating Designated Degree MP3s allow you set up totally simple modulations or high complex modulations go through a large number of key centers. You can also custom design the type of key center used. You could start with a simple example of modulating from a Major Key up a 4th to another Major Key. You could also create very complex key centers like a Symmetrical Diminished key modulating after 3 notes are heard to a Mixolydian b2,b6 center down a whole step. Again hear 3 notes in this key center. This would then loop back to your Symmetrical Diminished key center. Check out some of the examples below to see how you do. 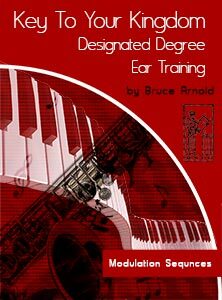 Below are some examples of the modulating designated degree ear training files. The first example plays 3 notes in the key of C then 3 notes in the key of G. If you were to put this into a play list and use shuffle play you will get random modulations between these two key centers. In this example I’m only using diatonic notes of a Major key for the key centers. All files are from the L3 exercises to give you more time to contemplate the key center. First play them all in the order below then randomly click on an MP3 and see if you freely move between these two key centers. The Modulation Sequences are included in the Bundle but can be purchased separately if you are only purchasing on instrument. They include an ever growing list of Modulation examples that show the real power of the MP3s in this course. Such chord progressions as “Giant Steps,” “Countdown,” “Rhythm Changes” and many other common chord progressions are include. These modulation sequences give you many different types of chord movement for instance moving chords in minor 3rds and other common chordal movements. You can also request sequences and we will add them as time becomes available. Next you hear a voice say “C” which tells you that the “4th” you are about to hear is in the key of “C”. Next you need to sing the root of the key. Since “F” is the 4th you need to sing “C” which is the root of the key. Remember no cheating! Like singing up or down to the key center. The next thing you hear will be the ii-7, V, I∆7 of Bb∆7 and the same process will happen but now you relate everything to the key of Bb. When you have completed the file you have just sung through a 2-5-1 moving down in whole steps. Thinking of every 2-5-1 in one key which moves down in whole steps. 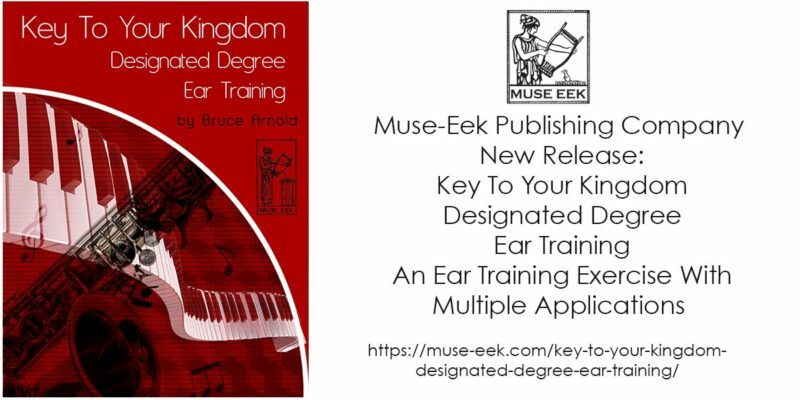 Key To Your Kingdom-Designated Degree Ear Training Get it Today! An ability to hear a degree of a key center and know the sound of the key center root.. Develop awareness of the sound of each degree in multiple octaves. Approach “Contextual Based Ear Training” using another “Context” thus helping memorization. Hone your ability to hear any of 12 designated Degrees in all keys and octaves. Learn to hear modulations to any key center. To to navigate unlimited numbers of modulations to any key, any key center type.. The melodic application of the designated degree concept also allows an advanced studies to create melodic lines that create other key centers over the initial key center being played by a group of musicians. This deep control of the key center of the moment one of the many benefits of working with the “Key to Your Kingdom-Designated Degree Ear Training Course. This entry was posted in Ear Training by Bruce Arnold. Bookmark the permalink.